For the first time, Oscar & Grammy award winning film composer Hans Zimmer releases sounds from his private sample library created by Bob Daspit. These powerful guitar textures are more detailed & expressive than any other Guitar library, with patches containing up to 12-way velocity switching, allowing for such nuances as dynamically-controllable string slides, pops & harmonics. The versatility of this collection is unmatched, ranging from a wide variety of pristine acoustics, vintage Telecasters, 32 meg leads, to a rare $11,000 Paul Reed Smith™ collectors edition "dragon" guitar! This outstanding library also includes Guitar grooves presented in every key signature and multiple tempos. 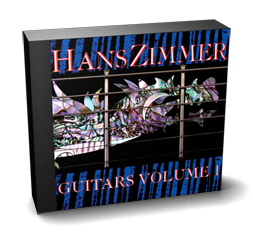 The current version of Zimmer Guitars vol.1 adds three additional new acoustic guitars -sampled without vibrato, in multiple dynamics: a beautiful new Nylon string, 6 string Folk Steel string & the unique Parker "Fly" Electro-Acoustic guitar. Also featured are major & minor acoustic guitar strum samples. These articulations are available in steel and nylon string versions, with both up and down strokes! Gladiator, Mission Impossible 2, The Lion King, The Rock, Crimson Tide, Broken Arrow, Rain Man, Driving Miss Daisy, Cool Runnings, Black Rain, True Romance, Thelma & Louise, A League of their Own & many others. A classic demo from EP showcasing the original Hans Zimmer Guitars and Bass Legends sounds included in the Omnisphere core library. This demo was played all in real-time and features the Martin 6-string and 12-string fingered acoustics as well as the Paul Reed Smith lead guitar. "Sounds phenomenal!...I'm using them constantly....the Martin acoustic is incredible!" "Those making electronic music will find no better way of programming guitar lines than by using this disc...an extremely useful resource." "Very Good....I was extremely impressed"
"The variation of steel & nylon acoustic guitars are brilliant...very realistic."